Having spent years experimenting, testing, experiencing and developing activities constantly trying to up our game in providing an activity that encompasses “adventure” and “Fun” we think we have hit the spot with our new and exclusive Amphibious Assault Course! 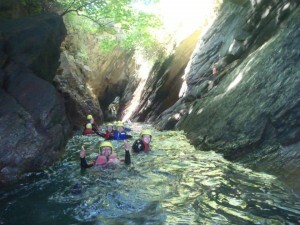 One recent challenger summed up their Hen experience by describing it as “Fun, tough and exciting all rolled into one. She also went on to say “This is a course for the adventurous and thrill seeking! 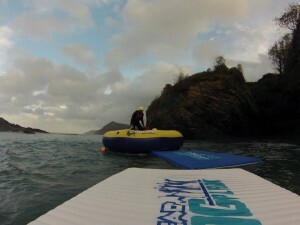 An amazing activity for Hens & Stags!! Would definitely recommend! !” totally great comments, thanks Becky. Of course the amazing dramatic location of Exmoor’s sea cliffs and Ilfracombes stunning coastline on which the Active Escape assault course is situated helps lead itself to the feeling of something special and rugged. The ever evolving Amphibious Assault Course as by its name takes place in the sea and on the land. Man made obstacles and the natural terrain make up this challenging course for groups of families, friends, Hens & Stags. This course works best as a team event. So after splitting into teams to bring the competitive and camaraderie spirit out of everyone the challenge is set! Hitting the water first it’s a swim out to the pontoons. Hauling yourself onto one pontoon then jumping the gap between the two, up onto the trampoline and bouncing back into the water (a few flips are always encouraged!). Race through the cave, up the blow hole and back onto dry land. Land obstacles consist of the black out tunnel. This is a belly/ hands and knees crawl through, groping your way to the light. 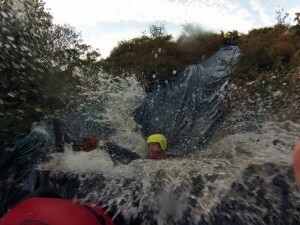 Then up and over the cargo net and on to the letter box squeeze finishing this section by shooting down the 10m slide into the water pool at the bottom! Scramble down the path over the rocks and back into the sea. Strike out to the trampoline sump, with a dive down into the belly of the trampoline before swimming out the other side. This is the point when the competition heats up with a race to the beach for the final challenge to find out who has earned the title of winning team and gets the hidden prize. This is a physical course but it’s been designed in a way not to break people but bring out their fun side. Helping your team and hindering the others on your way around the course you’ll be laughing/encouraging each other when you’re not trying to catch your breath. This is something a little different from your average Stag & Hen weekend activity and a high ranker when comparing other such weekends that people have been on.